WASHINGTON (AP) — Call them maybes. Two months out from Election Day, nearly a quarter of all registered voters are either undecided about the presidential race or iffy in their support for a candidate, an Associated Press-GfK poll shows. These voters could well prove decisive in a close contest. And they will be tough nuts for Barack Obama and Mitt Romney to crack. Just 29 percent of them have a strong interest in the campaign, compared with 51 percent of those who've made up their minds. So no, they won't be hanging on every word coming out of the national political conventions in Tampa, Fla., and Charlotte, N.C., over the next two weeks. Who are they? These so-called persuadable voters are more often men than women. They are a bit younger than those who've made up their minds. They have less education and income. And they are far less partisan. A quarter are independent or unaffiliated, while more than a third consider themselves Democrats and a similar share count themselves as Republicans. They are folks like Eric Avila, a 35-year-old Democrat from Tampa who didn't vote in 2008, has been unemployed since he was laid off from a sales job four years ago and doubts that either candidate will do much to reduce joblessness. Avila plans to vote this time but finds the campaign rhetoric from both sides grating. "It kind of gets on your nerves after a while," he says, "all of this stuff a person's promising, and it just gets forgotten or buried under a whole bunch of other things." Take that, Barack and Mitt. Their challenge is to figure out what will shift people like Avila firmly one way or the other. Ask the persuadables what will be the single most important factor in deciding their vote, and they have a multitude of answers at the ready. "Whoever runs the cleanest campaign," says one of those surveyed. "Whoever has the dirtiest ad campaigns on TV," counters another. A third, who speaks for many, confesses she has "no idea" what will win her over. How the persuadables ultimately vote could hinge on which issues rise to the top of the campaign. 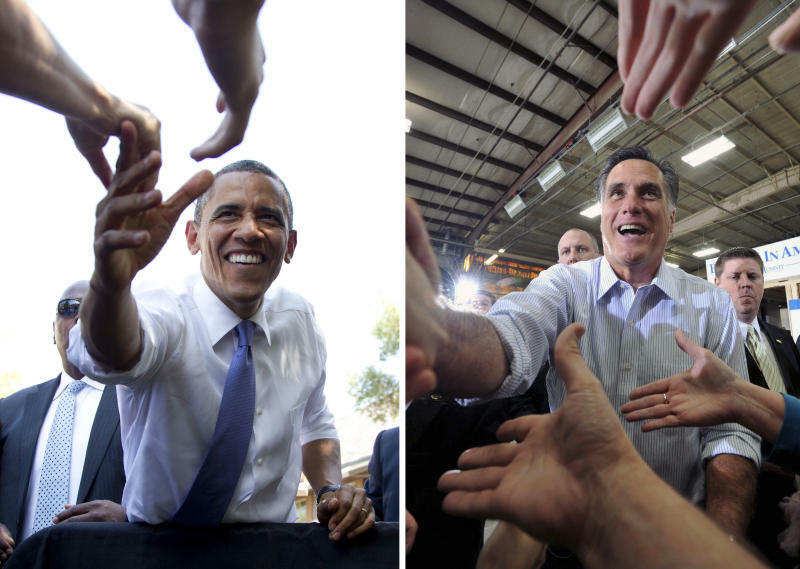 Romney holds the advantage among these voters on the economy, creating jobs and the federal budget deficit. But on two issues that have recently grabbed the spotlight — social issues and Medicare — Obama is the more trusted candidate among these voters. Neither Obama nor Romney carries much weight with the persuadables, though: Half have an unfavorable opinion of each candidate. Count Pam Zickert, an independent from Santa Maria, Calif., among those who are undecided and unenthusiastic. The 62-year-old retiree dislikes Obama, finds Romney "a bit bland" and has no intention of watching the political conventions. "It's tough to pick a presidential candidate when none of them are inspiring," says Zickert, who voted for Republican John McCain in 2008. William Galston, an expert on government and politics at the Brookings Institution and a former Clinton administration official, says that because the persuadables are more difficult to win over, Obama and Romney so far have been more focused on firming up support among their base supporters than on cultivating those on the fence. Romney's selection of conservative darling Rep. Paul Ryan as a running mate was "a decision to place mobilization ahead of persuasion," he says, and Obama's campaign has been systematically targeting the basic building blocks of his winning 2008 coalition: women, Hispanics, younger voters and gays and lesbians among them. In a polarized political environment and with limited dollars to spend, says Galston, "you can increase your vote total much more per dollar by ginning up the enthusiasm of the people who are already for you." Still, in a tight race, the persuadables could ultimately make the difference in key swing states, and they can't be ignored. The campaigns may well spend the convention weeks and September firming up their base supporters, then devote the debates and the final weeks of the race to reaching out to more fickle persuadables. In the AP-GfK survey, taken Aug. 16-20, the 23 percent of registered voters who are considered persuadable included 7 percent who expressed no presidential preference, 7 percent with soft support for Obama and 9 percent with soft support for Romney. The poll involved landline and cellphone interviews with 885 registered voters, including 192 considered persuadable. The margin of sampling error for registered voters was plus or minus 4.1 percent, and for persuadables 8.9 points. Will the persuadables actually show up and vote? History suggests yes. In an AP-Yahoo study that interviewed the same people multiple times over the course of the 2008 presidential campaign, 38 percent of registered voters were persuadable in interviews conducted just ahead of that year's conventions. When that same group was interviewed on Election Day, three-fourths said they had voted. When will the undecideds make up their minds? In 2004 and 2008, about 10 percent of voters reported they didn't decide until the last week, according to exit polls. Michelle Woodby, a 36-year-old Republican homemaker from Tecumseh, Mich., says she's been known to wait until the last minute. With small kids to care for and little time to watch the news, Woodby says she hasn't fully tuned in yet. So far, Romney's opposition to abortion has won her over, but Woodby says she's still got a lot of studying to do — and she shows a decided lack of enthusiasm for the job. "I need to do my homework," she says, "which I dread." Associated Press writer Josh Lederman and AP News Survey Specialist Dennis Junius contributed to this report.